You should be careful what you wish for, because you might just get something that looks quite like it. Ever since Jean-Claude Juncker first mentioned ‘capital markets union’ earlier this year, different constituencies across the financial markets have been busy trying to articulate their own version of what they would like to it to mean as they jockey for political position. The danger when you have a blank canvas and so many different people wanting to paint so many different things on it at the same time is that the end result will look like something by Jackson Pollock but without the artistic merit. Capital markets union cannot dig Europe out of its hole single-handedly. Unless governments engage in more fundamental structural reforms, there is a danger that the European economy will continue to slide sideways – and capital markets union will become a second order problem and be kicked into the long grass. There is a danger of assuming that everything about capital markets in Europe needs fixing. But many parts of the capital markets in Europe work well: big investment grade issuers do not have a problem tapping the capital markets, and this year the value of equity issuance in Europe is around 15% higher than in the US and the value of European IPOs is a third higher. Capital markets union could rapidly descend into an unwieldy laundry list that would get lost in its own complexity (we identified 99 different policy recommendations from a quick look at five separate reports). Instead it would be better to select a handful of tactical reforms that are a) achievable and b) have a concrete, measurable and significant impact. There are plenty of people in Brussels for whom no problem is so complicated that it cannot be solved without more regulation or another directive. Add to that the reflexive urge of many politicians to regulate and you have a recipe for a potential barrage of new regulation that would kill capital markets union before it even got started. Capital markets union is not an opportunity to solve problems that have eluded policymakers since the Treaty of Rome in 1957. Try to do much (or trying to do it too soon) – for example, by trying to harmonise entire swathes areas of tax and company law – would be a recipe for failure. Equally, the Commission might take one look at the sheer scale and complexity of the problem and decide that it would far safer just to finish off what has already been started in terms of a single capital market, and perhaps tinker at the edges with some achievable but unspectacular reforms. If you misdiagnose the problem then it is unlikely that the treatment will work. Too much focus on primary markets (rather than the secondary markets needed to support them), or automatically assuming that the decline in bank lending is a catastrophe that is starving healthy SMEs of credit, is unlikely to lead to effective policy responses. Too much focus on ‘union’, and not enough on ‘capital’ and ‘markets’, could also generate a lot of unproductive activity. Filling whatever funding gap may exist in Europe is not as easy as it looks. Direct lending by institutional investors is harder than it looks, crowdfunding is great but even if it doubles every year it will scarcely dent the market. Don’t forget that dedicated stockmarkets for SMEs and growth stocks have been tried before. Easdaq, anyone? Politics can always make things worse. Some ideas which have already captured the political imagination – such as the securitisation of SME loans or initiatives to build growth stockmarkets – could be rushed through the system in order to show that ‘something is being done’. Reform could also become politicised, with pensions assets being ‘allocated’ for infrastructure investment. The financial markets industry could shoot itself in the foot by using capital markets union as an excuse to sidestep painful reforms. Unless all sectors of the industry make concrete efforts to rebuild trust and overcome internal squabbling, it is unlikely that policymakers will feel the need to champion them or give them the hearing they deserve. Capital markets can play a part in encouraging growth but they cannot dig Europe out of its hole single-handedly and they certainly can’t do so by tomorrow. Unless governments in Europe – particularly in countries such as France and Italy – engage in more fundamental and often unpopular structural reforms, there is a danger that the European economy will continue to slide sideways (only this week, the European Commission downgraded its growth forecasts for the EU and eurozone from poor to terrible). If that happens, capital markets union will become a second order problem and could be kicked into the long grass. After all, it’s not as if the people of Europe have been marching in the streets demanding capital markets union (‘What do we want? Capital markets union. When do we want it? Now…’). It is also worth remembering that capital markets union is just one of three parts of Jonathan Hill’s job description: his full title is Commissioner for Financial Stability, Financial Services and Capital Markets Union. If and when a banking crisis erupts again in Europe, it’s fairly safe bet capital markets union brief would be put on hold. But many parts of the capital markets in Europe work well. For example, big investment grade issuers do not have a problem tapping the capital markets, and so far this year the value of equity issuance in Europe is around 15% higher than in the US and the value of European IPOs is nearly one third higher. Other markets, such as high yield bonds, are growing fast. There is a natural tendency to focus on the obstacles to the free flow of capital in Europe, when sometimes it might be worth reflecting on the remarkable progress that has been made over the past 20 or 30 years towards creating a single capital markets in Europe. There are lots of examples of harmonisation – such as banking union, UCITS funds or standardised documentation in the loan and high-yield markets – that we take for granted but which highlight what can be achieved, and quickly, when there is a clear market need and when policymakers and the markets put their heads together. Capital markets union could rapidly descend into a long and unwieldy laundry list. Any attempt to push through wholesale cultural, institutional and legislative change over the next few years would probably be counterproductive. For example, we looked at five different reports on capital markets and long-term financing in Europe (by the European Commission, the Association for Financial Markets in Europe, the City of London, the Centre for European Reform, and New Financial) and counted a minimum of 99 policy recommendations. Let’s call it 100. Even if you strip out the duplication, there are at least 50 separate policy recommendations already out there (all of the recommendations are at the bottom of this article). Instead it would be better to select a handful of tactical reforms that strike the right balance between a) being achievable and b) having a concrete, measurable and significant impact. How to select these priorities – when different parts of the industry and different countries have such fiercely held views – is the multi-billion euro question. A good starting point would be to identify and mobilise those organisations that demonstrably struggle to access or deploy capital effectively – such as medium-sized European corporates and pension funds. There are plenty of people in Brussels for whom no problem is so complicated that it cannot be solved without more regulation or another directive. Add to that the reflexive urge of many politicians to regulate – and the legislative hyperactivity of Hill’s predecessor Michel Barnier – and you have a recipe for a potential barrage of new regulation and additional structures around capital markets union. Instead, the focus of capital markets union should be on removing the existing barriers to the free flow of capital across borders in Europe, on finishing what the European Commission has already started, and on measuring the benefit, cost and impact of existing rules before writing new ones. It is encouraging to see that Hill has so far shown he is inclined not to be rushed. In his speech at the conference today, he stressed that while there was not going to be a bonfire of financial regulations, he would pause to reflect on whether the European Commission has the right-balance between reducing risk and encouraging growth. Hill has said he will focus on a small number of areas and work out the individual and cumulative effects of existing legislation and regulation, before putting together an action plan by the end of summer 2015. Capital markets union is not an opportunity to solve problems that have eluded policymakers since the Treaty of Rome in 1957 or the Single Market Act of 1986 (when the freedom of movement of capital was named as one of the four main ‘freedoms’ along with people, goods and services on the first page of the treaty). Trying to do much – for example, by trying to harmonise entire areas of tax and company law at the same time – would be a recipe for failure. Trying to do it too soon could also hole the project before it has even got started. Do we need an action plan by the middle of 2015? Does that leave enough time to really think through the challenges and priorities? We have waited more than 20 years since the official launch of the single market – so what’s the rush? The danger here is that capital markets union pursues the desirable rather than the achievable. Harmonising withholding tax regimes or the unequal tax treatment of debt and equity across Europe would have a transformative effect, as would harmonising insolvency regimes and bankruptcy laws across Europe (click here for a terrifying look at the differences in existing law). But Hill and his team would probably have better luck achieving world peace and abolishing global poverty. Alternatively, the Commission may not be ambitious enough. Hill might take one look at the sheer scale and complexity of the problem and decide that it would far safer just to carry on what has already been started in terms of a single capital market, and perhaps tinker at the edges with some achievable but unspectacular reforms. Hill has already said that his priority is to finish what has been started, and that there are some obvious initiatives such as ELTIFs (European long-term investment funds) and pushing ahead with the development of a private placement market, on which work can start immediately. It might be best to see how those two initiatives work out before setting anyone’s expectations too high. If you misdiagnose the problem then it is unlikely that the treatment will work. A lot of focus has been on primary capital markets when the bigger problems may be in the secondary markets that you need to support them.(ref. the recent volatility in the US bond markets, or the high costs of cross-border clearing and settlement in Europe). There is also a widely held assumption that the decline in bank lending is a problem in itself and that many companies – particularly SMEs – are being unjustly starved of credit. 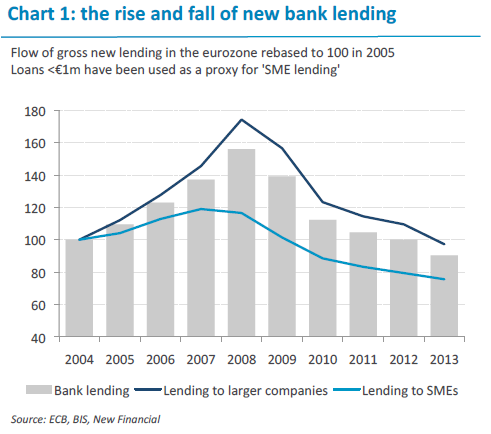 If you accept that banks lent too much money too loosely before the crisis – not a controversial view – then you have to accept that a large part of the 40%+ fall in new bank lending to SMEs in Europe is a healthy adjustment. Equally, policymakers should beware of blindly copying the US model (in which 80% of corporate funding comes from capital markets compared with just 20% in Europe) when the institutional and cultural framework is so different. There is also a risk that the European Commission and European Parliament will focus too much on ‘union’ (ie harmonising rules and regulations) and not enough on ‘capital’ or ‘markets’. Filling whatever funding gap may exist in Europe is not as easy as it looks. For all of the noise and political impetus behind ‘direct lending’ – in leveraged loans, private placements or infrastructure investing – some asset managers are finding that they don’t have the right skills and expertise and that it is harder than it looks. Innovations such as crowdfunding and P2P lending have made impressive progress, but perhaps it is best to reserve judgement on whether they will displace traditional banking models until after interest rates have gone up a few notches? Dedicated SME or growth stockmarkets look and sound great – but they are a tiny source of funding. 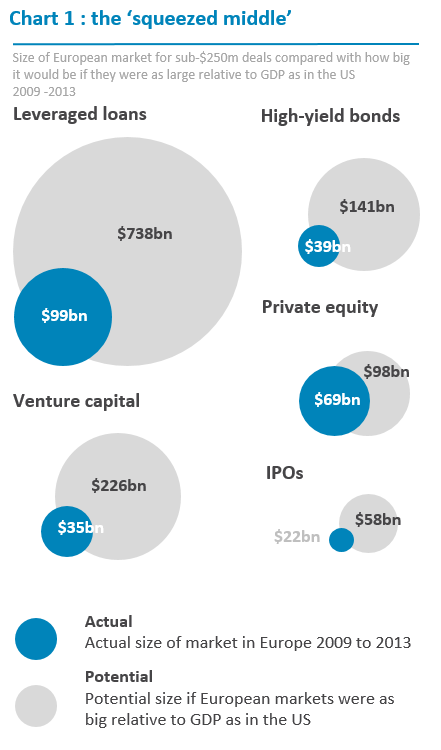 IPOs of less than $100m in Europe raised just $13bn in the five years to 2013. That’s less than $3bn a year, or a few days worth of new SME bank lending in Europe. Politics could also get in the way. There is a risk that some ideas which have captured the political imagination – such as the securitisation of SME loans or initiatives to build growth stockmarkets – could be rushed through the system with unrealistically high expectations in order to show that ‘something is being done’. Reform could also become politicised, with pensions assets being allocated (or more accurately ‘appropriated’) for infrastructure investment, or particular countries insisting on particularly difficult policies as a quid pro quo for getting what they really want or (worse) as a subtle means of torpedoing the entire project. For example, the finance minister of country recently said capital markets union ‘must’ include the harmonisation of insolvency law – which is about as likely as getting Nigel Farage to vote in favour of a bigger EU budget next year. If in doubt, look at the vote in the European Parliament against the appointment of Hill as a commissioner, for no other apparent reason than the fact that he was a) British and b) might have once advised a bank on its PR. The financial markets industry is perfectly capable of stealing defeat from the jaws of victory. It might try to use the need for growth as an excuse to sidestep painful reforms and to press pause on all of this touch-feely culture and trust stuff. Even supporters of liberal capitalism and free markets have lost faith in many aspects of the industry (see the excellent the recent speech by Minouche Shafik at the Bank of England: ‘well-functioning markets are the key to prosperity but they must operate in ways that are fair and effective to sustain public support and confidence’). All sectors of the industry will need to make concrete efforts to reform themselves and rebuild trust – with policymakers, with clients and with each other – to prove that they can be let out on a longer leash. As Hill said today, the industry must engage more constructively if it wants policymakers to champion its role and contribution. And the industry will need to overcome squabbling between different sectors over policy priorities that could stop capital markets union in its tracks. We have read five different reports on capital markets and long-term financing in Europe so that you don’t have to, and summarised their policy recommendations. All 99 of them. Focus less on expanding access to capital markets for SMEs and more on ‘squeezed middle’ companies between $50m to $250m. Encourage creation of longer-term pools of capital, such as auto-enrolment / compulsory funded pensions schemes.